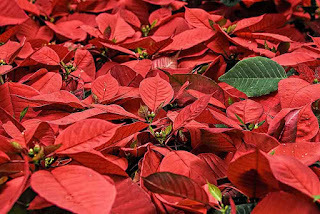 Agromin Blog: Enjoy the Holidays by Gardening in December! Enjoy the Holidays by Gardening in December! The holidays are a busy time of the year, but for those who love to garden, there is still plenty to do in December. Harvest Your Fall Vegetable Crop: It's time to start harvesting vegetables from plants sowed in September and October. You can even add more vegetable plants before it gets too cold. They include artichokes, asparagus, beets, broccoli, cabbage, carrots, cauliflower, peas, potatoes and radishes. Note: expect them to grow slower than those vegetables planted in spring. Plant Bare-Root Fruit Trees: Now is the best time to plant bare-root fruit and nut trees such as apricots, apples, cherry, peaches, plums and walnut. You'll find an assortment at your local nursery. Soak the roots in a bucket of water for an hour before planting Dig a hole large enough to hold the roots. Spread out the roots to encourage growth. Thoroughly water. Cover with a layer of mulch. Keep your tree moist for the first several weeks (regular rainfall will be enough). Bare-root trees are often less expensive than potted trees because they come without the plastic container. Prune Deciduous Fruit Tree: Prune deciduous trees once they have dropped their leaves. Don't be afraid to give the tree a healthy trim as they will bounce back nicely in spring. Fill In Bare Spots in Your Lawn: Since southern California winters are mild, there is still time to seed bare spots in your lawn. If rain is sparse, you'll need to water regularly. Start A Mulch Pile: Rake up leaves and create a homemade mulch pile. Add leaves and grass clippings. Water the pile (if necessary). Turn once a week. You'll have compost by spring. Remove Dead Flowers and Branches: Gardens can look a bit ragged in winter. Keep them fresh by cutting away dead flowers, leaves and branches. Consider cutting back large trees including pines and oaks if limbs look weak or have become overgrown. Recycle Your Christmas Tree: Check with your city on how and when to recycle your Christmas tree after the holidays. Remove all decorations and lights. Most recyclers will accept flocked and unflocked trees. Extend the Life of Poinsettias: During the holidays, keep poinsettias in a cool indoor location—away from heating vents and fireplaces. Once spring arrives next year, cut the stems back. Put them outdoors in the shade during summer and then bring them back indoors in fall. To get the dark red leaves that poinsettias are known for, they'll need to spend half of the day in total darkness beginning in October. They'll start blooming—ready for next Christmas—by mid-November.